Kaarasaaram: Event Announcement - "Only Icecreams"
Event Announcement - "Only Icecreams"
It is now time to announce that I will be guest hosting one of the most famous and talked about event in this blogosphere "Only Series" created by Pari . Thanks to you Pari for coming up with this event series and letting me guest host your event for June. I must say it is one of the most innovative event which helps concentrate on one particular theme by which a new array of traditional, modern and fusion dishes are created and showcased. Each theme is a challenge and this month's theme is right for this season. The hot sun, the heat and the warm breeze makes the body and taste buds demand for something cool and sweet. What better way of cooling down the body other than ice creams. Yes guys, this month's theme is "Only Ice creams". There is no need for me give an introduction about this delectable treat which cools every human's heart. So don't be shy to whip up some wonderfully delicious ice creams ... the only criteria is that it should be frozen. It can be with or without eggs, with only one flavour or a mix of flavours, in a cup or a cone and it can be of any colour. As you all know this event has a winner selected by me by Random.org and he/she has to provide me with an address in India within two days of the winner declaration else a new winner will be selected by me. Please note: This giveaway is only for participants from India and will shipped to any place in India only. Eager to know what the gift is ... the winner will receive a cookbook "Ice Creams and Frozen Desserts" authored by Tarla Dalal, very well known talented chef. The details can be found in Pari's event announcement page . 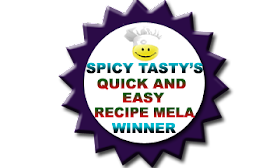 Please do visit her website: www.tarladalal.com for more interesting recipes, cookbooks and general browsing about good food. Logo for the event is beautifully designed by Pari. 1.Any number of fresh entries can be sent but only 2 entries from the archives will be accepted. Archived entries should be reposted, else will not be accepted. 2. Eggs are allowed but recipes with alcohol will not be accepted. 3.Use of logo is mandatory as it helps spread the word and more over it is a beautiful logo , so please do include it in your post. 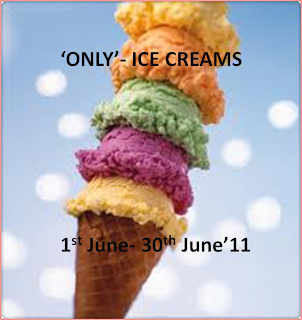 4.The entry should be linked back to this announcement page and Pari's "Only-Ice Creams" event announcement page . 5.The winner of the book from Tarla Dalal will be selected by me by random.org after the roundup. 6.Pleases stick to the format for sending in your entries. Send them from the 1st of June to 30th of June. f. Picture of the recipe resized to 300 pixel in size. 7.I will be posting the roundup within 7 days of completion unless there is an unforeseen emergency. 8. I cannot participate in the giveaway as I am guest hosting it. Have a wonderful time hosting Reva.. Brilliant! You have all these summer events lined up huh? :) Can't wait to see the frozen treats! And to think, I just made a vow to use my ice cream maker more! Perfect timing! 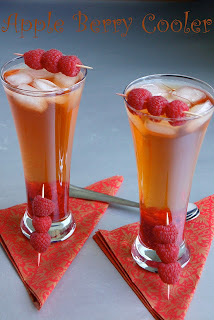 Superb theme for the hot weather...Happy Hosting.. Wish you great success! WIll be waiting to eat the ice cream virtually. excellent event for hot summer !! Happy hosting dear, will surely send in my entries. 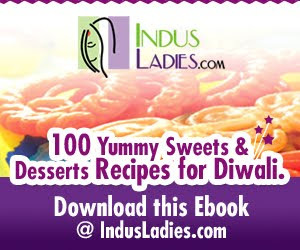 All the best dear for the event, pls mention that the book will be only shipped in India so that there's no discrepancy. A very nice choice of topic.. just in time for summer.. Will sure send my entries.. Happy hosting Reva. Perfect event for the season. 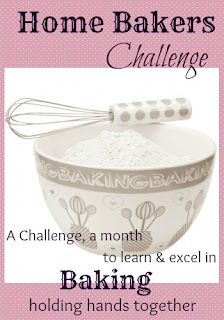 Will surely participate...BTW ur guest post is now on my blog!! Wonderful event Reva....Loved your raggi koozh and the beautiful presentation. Wonderful event.. count me in dear.. happy hosting ! !